The stylish and sophisticated slip-on natural rubber boot from Tretorn. 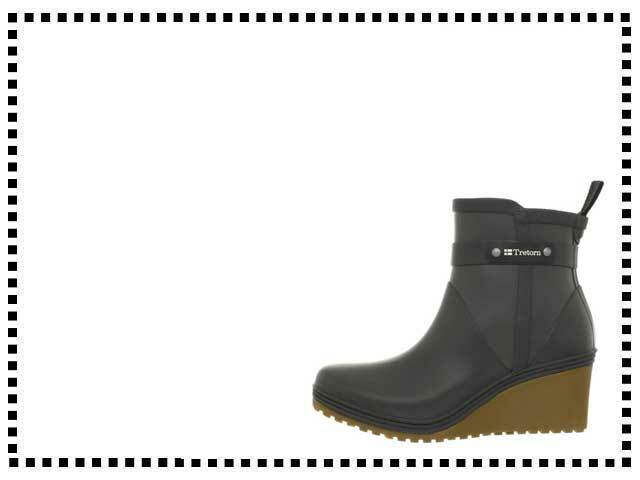 The Plask Mid is an ankle length, 100% waterproof rain boot from the iconic Swedish designers Tretorn. These boot are flexible and comfortable enough to wear all day long. They feature a stretchable side panel that makes them a breeze to pull on and off. These boots are so cute. I love them, can’t wait for rain. Fabulous rain boots. I love the wedge heels, I have had loads of complements about them. My favorite rain boots ever. Perfect fit for me, even with thick socks. Quite expensive compared to other rain boots but they are worth the money. These are the first pair of wedge rubber boots I have seen and they are so cute! Very fashionable for rain boots. Great quality as well, I would happily recommend Tretorn. Really nice boots. They do rub against my ankles a bit which is annoying. Apart from that they are great. Wedge heeled fashion rain boots. Available in black, gunmetal, Atlantic and sea spray colors.